These spider crabs (Majidae) from Carrie Bow Cays (Belize) also consume the invasive tunicate Didemnum psammatodes. Native species can prevent non-native species from establishing through predation* and competition*. By doing so, native communities exert what is known as biotic resistance*. Can biotic resistance (or the lack thereof) explain broad scale patterns of invasion? Perhaps, the tropics appear to have few non-native species. Biotic resistance in the tropics may therefore prevent non-native species from establishing because newcomers are preyed upon or are unable to compete. In contrast, non-native species are abundant in the temperate zone* (e.g. the north eastern coast of the US), which appears to have weaker biotic resistance. Researchers at SERC are collaborating with scientists at the Smithsonian Tropical Research Institution (STRI) in Panama and at Temple University to address the question of invasion from the tropics to the temperate zone, and taking advantage of MarineGEO, a network of Smithsonian marine laboratories. For this research, we are conducting field experiments that assess the importance of predation and competition in preventing the establishment of non-native species. This work is being conducted along the Atlantic and Pacific coasts of North and Central America in marine fouling communities*. Fouling species are suitable for this study because they represent a large fraction of the non-native species that have become established and because they are easy to manipulate. Ultimately, this research will help clarify the importance of native biodiversity in providing resistance to invasion. 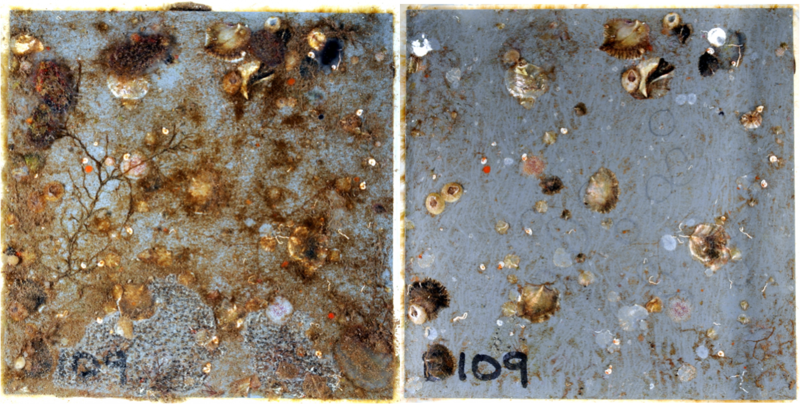 Left plate: Plastic plates are inoculated with tunicates, sponges, bryozoans, and bivalves. Right plate: The same plate was exposed to native predators and only shelled animals, such as oysters, survived. Kimbro, D. L., B. S. Cheng, and E. D. Grosholz. 2013. Biotic resistance in marine environments. Ecology Letters 16:821-833. Freestone, A. L., R. W. Osman, G. M. Ruiz, and M. E. Torchin. 2011. Stronger predation in the tropics shapes species richness patterns in marine communities. Ecology 92:983-993. Predation The act of one animal consuming or preying upon another. Biotic resistance The ability of a native community to suppress non-native species, often through predation and/or competition. Fouling communites Marine animals and plants that commonly live on hard substrate (e.g. ships, docks, and rocks), often near or within estuaries. They are termed 'fouling species' because they can be a nuisance to boaters and dock owners. Fouling communities often possess many non-native species.